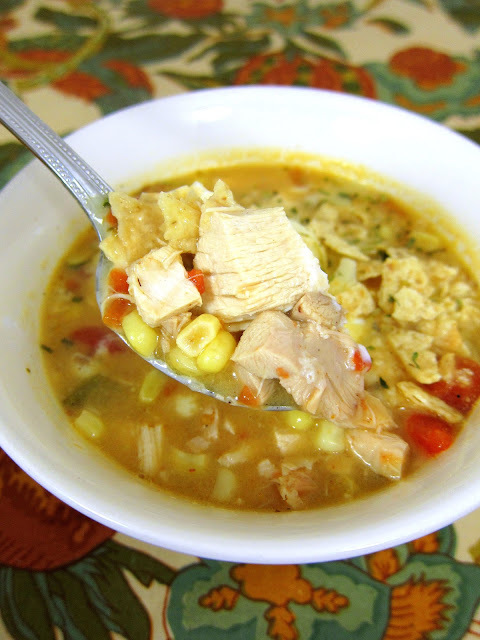 Quick Chicken Tortilla Soup - use rotisserie chicken for a super quick soup that is ready in 10 minutes! Chicken broth, Rotel, corn, chicken, cream of chicken soup, chili powder, garlic and onion. Top with sour cream, tortilla chips and cheese. We love to make this quick soup during the week! Serve with some warm bread or cornbread. This recipe was a collaboration between my mother and me. She emailed me a recipe that she created and I changed it up even more. This soup is a super quick meal. I used some rotisserie chicken and the soup was ready in minutes. This has a slight kick from the Ro-tel tomatoes. If you don't want any heat in the soup, use a can of mild Ro-tel or a can of Mexican stewed tomatoes. We topped the soup with Monterey Jack cheese, tortilla chips and sour cream. It was really delicious. It was even great reheated for lunch. This is a great weeknight meal for this busy holiday season! In a large pot or Dutch oven, combine all ingredients. Bring to a boil and simmer 10 minutes, stirring frequently. Serve with sour cream, crushed tortilla chips and Monterey Jack cheese. This looks yummy! About how many cups of cooked chicken would you say this is? Thank you! This sounds good. I make tortilla soup every year. I like the idea of the chicken already cooked! This is a good one too, Steph. Love this soup and it was so easy to make! I'm totally making this! We eat tortilla soup almost once a week and I'm always trying new variations. Love the cream of chicken soup shortcut, and I'm sure it still tastes great with all the spices and broth. The only thing I'd add is cumin. Can't leave out the cumin. Bout how much cumin would you say? I made the over the weekend and everyone loved it. It was nice not having to saute the onions and garlic -- not that I hate sauteing or anything, but when you want to throw together a quick lunch it's kind of nice to be able to just dump everything into the pot and simmer. The cream of chicken soup added the right amount body. I left out the corn and threw in a couple of torn up corn tortillas for texture and added cumin because it's one of my favorite spices, but other than that I followed your recipe and it was terrific. I'm so glad y'all enjoyed it! Can't wait to try it. Thanks for sharing all your wonderful recipes! I just stopped by to say I've been making this soup almost every weekend for the past month. I do change it up, but the ingredients as listed are a good start. I dump in some chopped carrots, a big squeeze of honey, a bay leaf and (as mentioned the last time I raved about this one) a lot of cumin. YUM! Those changes sound delicious!! I'm going to try some next time we make this! It is finally chilly here, so soup is on the menu!